11h05 INFANTIL MASC. C.B. 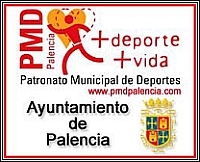 PALENCIA "B" BASKET BURGOS 2002 "B"
17h40 INFANTIL MASC. C.B. PALENCIA "A" BASKET BURGOS 2002 "A"
17h00 BENJAMÍN MIX. C.B. PALENCIA LOURDES "A"
18h00 ALEVÍN MASC. C.B. PALENCIA "A" SAN JOSÉ J. "A"
19h00 BENJAMÍN MIX. C.B. PALENCIA SAN JOSÉ J. "A"
20h00 ALEVÍN MASC. C.B. PALENCIA "B" SAN JOSÉ J. "B"
10h00 BENJAMÍN MASC. C.B. PALENCIA C.B. VALLADOLID "B"
11h30 INFANTIL MASC. C.B. PALENCIA "A" C.B. LA FLECHA "A"
13h00 ALEVÍN MASC. C.B. PALENCIA "B" C.B. LA FLECHA "A"
16h00 ALEVÍN FEM. C.B. PALENCIA C.B. LA FLECHA "A"
16h00 INFANTIL MASC. C.B. PALENCIA "B" C.B. VALLADOLID "C"
16h00 BENJAMÍN C.B. PALENCIA C.B. LA FLECHA FEM. GRUPO ROJO C.B. PALENCIA "A" LOURDES "A"
GRUPO VERDE C.B. PALENCIA "B" LOURDES "B"
GRUPO ROJO C.B. PALENCIA "A" FILIPENSES "A"
GR. AMARILLO C.B. PALENCIA Benj.Mix MARISTAS LEÓN FEM. "A"
GRUPO ROJO C.B. PALENCIA "A" OBILA C.B. AVILA "A"
GRUPO ROJO JESUITAS SAN ANDRES C.B. PALENCIA "A"
GRUPO AZUL BENAVENTE C.B. C.B. PALENCIA "B"
¡¡¡ C.B. PALENCIA CAMPEÓN !!! 17h15 ALEVÍN C.B. PALENCIA C.D. CAMPOO Infantil Fem.